Theories of leverage cycles have been around for awhile: to name a few examples, in the work of Irving Fisher back in the 1930s, Hyman Minsky in the 1970s, and John Geanakoplos in the last decade or so. Here, I'll offer a quick description of the theory of leverage cycles, and why it makes a plausible explanation for financial crises and at least some recessions. There has been some question about how well the data supported such a story. I'll offer some basic graphs suggest that the Great Recession in the U.S. economy can be interpreted (at least in part) as a leverage cycle. In addition, in a recent working paper called "When Credit Bites Back: Leverage, Business Cycles, and Crises," Oscar Jorda, Moritz Schularick, and Alan M. Taylor (no relation) present evidence on the importance of leverage cycles based on data from almost 200 recessions in 14 advanced economies between 1870 and 2008. If sharply rising leverage poses systematic macroeconomic hazards, it suggests that central banks and other policy-makers should be paying attention to this variable as the economy evolves. "Leverage" is the term that economics and finance people use for the extent of borrowing. To illustrate the theory of the "leverage cycle," I'll first use an example from housing markets. Say that the housing market is using a general rule (with a few exceptions) that people need to have a 20% down-payment. But over time, housing prices seem to be stable or rising, so that 20% begins to seem overly stringent. 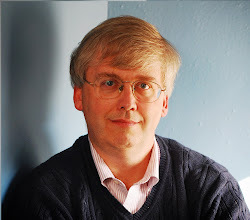 More loans get made with a 10% downpayment, or no down-payment, or subprime mortgages to those who wouldn't have qualified to borrow earlier, and all the way to the infamous NINJA loans, made when the borrower didn't provide any financial information: that is, "No Income, No Job or Assets." The greater ease of borrowing means more purchasing power to buy houses, and the rising price of houses that results makes it seem like even lower down payments make sense. The same logic leads people to increase their leverage by taking out bigger loans over longer terms, or of the loan, or mortgages that reset with much higher payments. But of course, as the down payments fall and leverage increases in these other ways, borrowers become much more vulnerable to a downturn in prices. And a leverage cycle pops, not only borrowers but those holding the debt, like banks and financial institutions, are vulnerable as well. Now extend the example of increase borrowing ("leverage") for housing across all sectors of the economy. When the economy is going well, the risk of default looks low, and borrowing expands: that is, more borrowing for housing, for cars, for credit cards, for student loans. More borrowing by businesses and by financial firms. The greater borrowing pushes up the economy for a time, but borrowing can't stay on a rising trend forever. When the bubble bursts, those who have overborrowed still need to make their interest payments. Some will be unable to do so, and many will make the payments but retrench for a time, trying to minimize their borrowing and reduce their debt levels. Just as the climbing leverage in the upward part of the cycle supported an expanding economy, the falling leverage in the downward part of the cycle magnifies the downward effects. The claim isn't that leverage cycles explain all recessions, but rather that they can help explain why some recessions--often those that also include a financial crash--can turn out to be so severe. The U.S. data on borrowing certainly suggests that leverage went through a leverage cycle. Here are two graphs from FRED, the ever-useful website run by the St. Louis Fed. 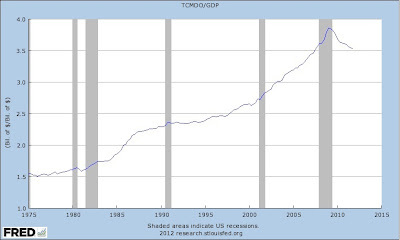 The first shows total bank credit in proportion to GDP. 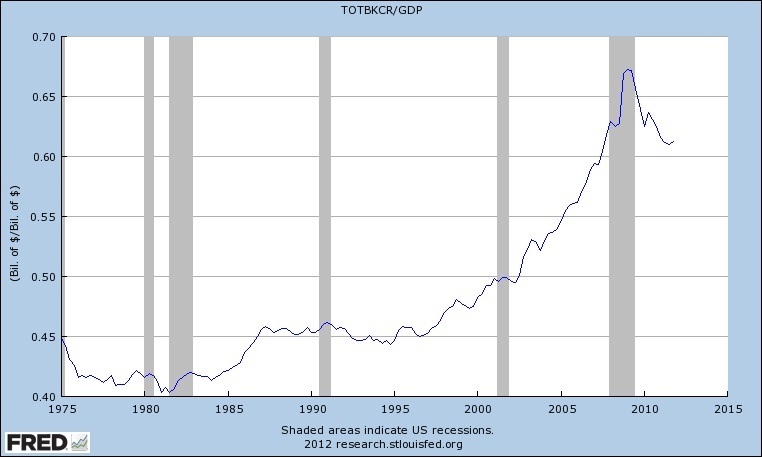 Total bank credit was about 45% of GDP, give or take a bit, from 1975 through the mid-1990s. 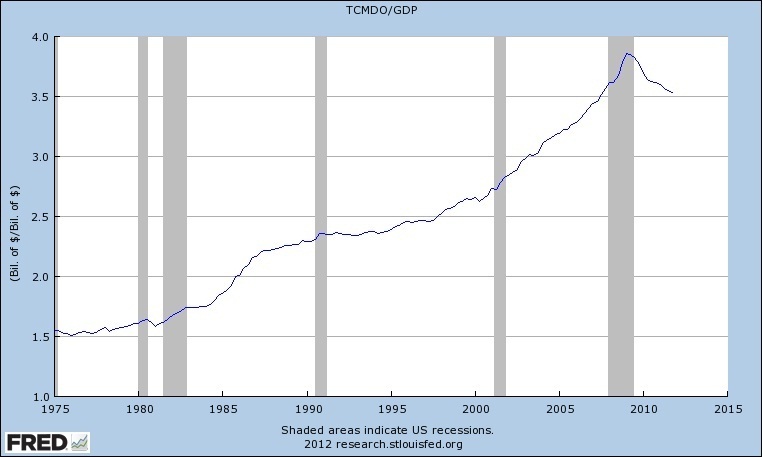 But then it starts rising, hitting 50% of GDP by about 2002, and then shooting up to about 67% of GDP by 2009. It has dropped since then, but is still above 60% of GDP. But when leverage rises this fast, it has "bubble" written all over it. A second table tells a similar story, but this time using total credit market debt owed--that is, including bank debt along with bonds and commercial paper and other forms of borrowing--divided by GDP. One might expect an economy's ratio of bank credit/GDP or total credit/GDP to rise gradually over time, as financial institutions in a country become more developed and sophisticated. 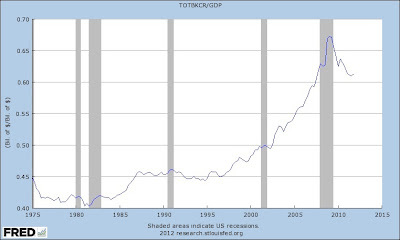 But notice that it takes 28 years for total credit market debt to rise from 150% of GDP in 1975 to 300% of GDP in about 2003--and then just six years for it to rise from 300% of GDP to 400% of GDP. Also, notice that in earlier recessions, these measures of leverage flatten out, but don't drop off noticeably. The Great Recession looks like a time when, unlike other recessions in this time period, borrowers and lenders as a group felt a need to pull back dramatically. Indeed, that's one way to illustrate what a "financial crisis" means on a graph. credit-intensity of the expansion phase is closely associated with the severity of the recession phase. In other words, we show that a stronger increase in nancial leverage, measured by the rate of growth of bank credit over GDP in the boom, tends to lead to a deeper subsequent downturn. Or, as the title of the paper suggests--credit bites back. This relationship between leverage and the severity of the recession is particularly strong when the recession coincides with a systemic financial crisis, but can also be detected in "normal" business cycles." "In a normal recession the drop in private loans mirrors the drop in real GDP per capita and the amount of leverage appears to have almost no eff ect. Thus at the six year mark, the cumulated drop is also about 5%. Contrast that with the severe contraction in lending during a nancial crisis recession. With average levels of excess leverage, lending activity drops by three times more than in normal times, about 15%. Measured against the decline in output during the same circumstances, the ratio is about 2-to-3. ... [W]here is the drop in lending most acutely felt? ... In normal recessions, the cumulative decline in the investment to GDP ratio is roughly on a par with the decline in output (but since we report the ratio, this naturally means that investment is declining faster than output). These declines are far more dramatic during fi nancial crisis recessions, almost three times as large in magnitude." A key policy question from the Great Recession is what policy-makers should be looking at. Saying that it should be national policy to make sure that housing prices don't rise too fast or don't fall, or that the stock market won't fall, seems unrealistic and counterproductive in a market-oriented economy. (After all, part of what drives a leverage cycle is a belief that the danger of falling prices is so low.) But data on bank credit and total credit are available on a regular basis. At least a couple of years before the financial crisis first hit in late 2007, it would have been possible for the central bank and financial regulators to take various steps to slow the credit boom. Of course, it would have been politically unpopular at that time for them to do so! But as the economy staggers through a shaky recovery, with unemployment rates predicted to stay above 8% into 2014, maybe serious policy-makers can find the courage to forestall the next credit boom before it leads to such a devastating crash.